Dingotopia entrance sign complete with dingraffiti. The dingo is one of many Australian creatures which will kill you and steal your babies. They are despised globally for this and if you even say the word, "dingo," you shall be punched in the face. They have even been classified as Spuck. Dingos are the product of repeated couplings of Sam Waterston and one of his many legal aides, Hel, the daughter of Loke. The two were so prolific that Sam Lincoln had to build a giant playpen in order to contain the dingo population; this structure later served as the foundation of the Pentagon. Abraham Waterston was eventually driven to move the dingos to an isolated location where they could run free and generally act like the spoiled rich kids they were. This place was Antarctica. He got tired on the way, though, and stopped for a beer in Australia, "accidentally" letting the kids loose. The dingos quickly spread, dominating most of the wildlife with the exception of the kangaroos, who continue to lord over the dingos their ability to jump higher and further. Since 1983, as one of the provisions of Australia's involvement in The War on Terra, dingos were given and have since controlled a region of Australia thirty-seven times the size of Rhode Island which they have named "Dingotopia". They have since erected the world's largest fence in order to keep the humans out. It's also too high for those snooty kangaroos to jump it. Recently, Dingoman John Jackson submitted a motion to update Dingotopia's fence, intending to replace the original with a fully-functional muppets Death Fence. 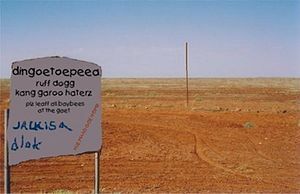 Bitter rival Jack Johnson, however, attempted to quash the attempt, citing reports that, in the year 2003 alone, 14.000 Aussie bogans perished as a result of urinary electrocution. Johnson's efforts inadvertently garnered the motion overwhelming support from Australia's ruling elite. Continuous debate holds the motion in a state of flux with no resolution in sight. 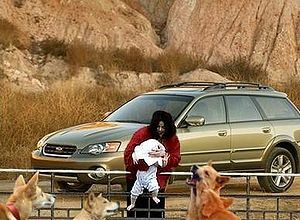 Michael Jackson demonstrating the correct way to feed dingos. Dingos travel in packs of 2d4+1, usually consisting of an alpha pair and its offspring. It is a common misconception that dingos eating babies is bad; this is in fact a valuable social service rendered at no charge to you. Just leave the gate open, 'kay? The truth of the matter is that dingos are executing a deep psychological need to get back into that big playpen from whence they all came. They just don't like sharing the playpen with some screaming brat. The fact that dingos have sharp teeth for ripping through reinforced steel playpen bars and eating babies (their preferred food source) is merely a pleasant coincidence. Some of the more popular dingo activities include rugby, attacking department stores and organizing militias. When they get really drunk they might get up the courage to go give one of the local bunyips a toss, but no worries, eh? Dingos are known for their poor sense of humor, as their favorite genre of joke is the dead baby joke. If you want to get anywhere in Dingotopia and not get eaten, it helps to have an encyclopedic knowledge of dead baby jokes and a good sense of comedic timing; a traveller must be able to balance the dingos' capacity for entertainment with the prospect that dead baby jokes may come to remind them that they haven't eaten for a while. All dingos have a deep-seated pathological terror of trashy young American female celebrities. A herd of dingoes had to be rushed to the Dingotopia Veterinary Hospital's ER after accidentally being exposed to television coverage of Nicole Richie. Most of them eventually made full recoveries after Dr. Phil's heartrending three hour special chronicling their trauma led Dr. Spock to perform round-the-clock Vulcan mind-melds. Sadly, several of them resisted the mind-melds with a violent round of projectile vomiting and had to be committed to psychiatric institutions. In a related story, a pack of teenage dingos made headlines after being pursued by a psychotic Lindsay Lohan, who reportedly had plans to breed them and eat the babies.